We are extremely pleased with the graphic images covering the Aliant Utility Box on the outskirts of the Park. You will recall that in June 2014 we issued a "Call to Artists" to submit proposals for the painting of the box, but after attempting relentlessly for six months, we were unable to get any artist to commit. We then looked at the approach of having a graphic attached to it and we are so thankful that Greg Seaward offered to draft a graphic design for us. After hundreds of hours, Greg submitted his final concept and the Committee were in awe of how he captured all the aspects of the Park and thus the printing and application began. In his presentation Greg describes how he interprets the artwork: In terms of symbolism, the front image (above) represents wartime service, featuring a young pilot wearing a traditional sheepskin jacket, leather cap and goggles, as Hudson bombers pass overhead; the Lee-Enfield rifle and Brodie-style helmet represent those killed in action, and these elements are presented against a background of the Union Jack, the flag which Newfoundlanders fought under at the time. 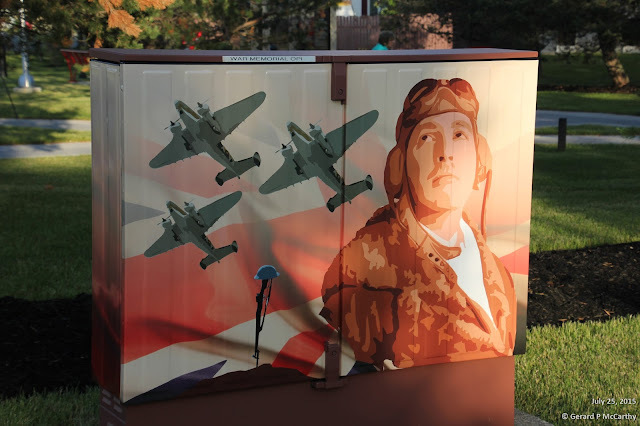 Facing the park (above), the same symbols are presented in their contemporary forms, from the perspective of remembrance: the pilot is replaced by an aging veteran and the aircraft have become CF-18s; the temporary grave marker has given way to the Cross of Sacrifice from the Commonwealth War Graves Commission Cemetery and the background has become the Canadian flag. It should be noted that in this interpretation, these are simply symbols of the overall theme of the Heritage Memorial Park, and are in no way intended to represent or exclude any specific people or events. For example, the Lee-Enfield and Brodie helmet may also be associated with the First World War, but less so the Korean Conflict; it simply represents the fallen on the figurative 'field of battle', and not a specific conflict or branch of service. Likewise, I chose the Cross of Sacrifice more because of the permanence of stone, juxtaposed against the makeshift rifle/helmet, rather than, say, a poppy to signify remembrance. 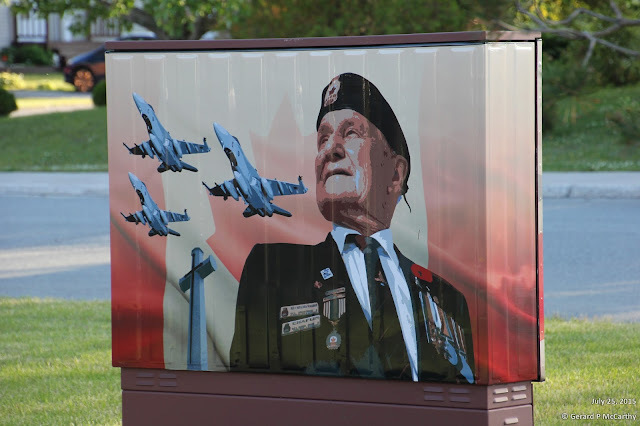 We gratefully thank Greg Seaward for the design, Aliant and the Town of Gander for their donations to make this transition from a utility box to a wonderful enhancement to the Park! Greg Seaward is a former Gander Beacon reporter and now Media Coordinator for the Town of Gander. Before you click Publish your Comment please click on Name/URL and enter your full name. Don't forget you have to prove that you are not a robot - this is so automated spams cannot be dumped here! Each and every member of the Committee wishes to pass on their sincere appreciation to these contributors for their kind consideration and support of the Park. Gerald Saunders of the Gander Co-op 50/50 Committee presents Joy Janes with a cheque for $30,000! Jean Edwards Stacey presents Maxine Smith with a cheque for $1,500 representing a portion of the sales from her book, "Voices in the Wind – A History of Gander". We now have an updated Donations page and an updated Donations Progress Bar with an updated Ticker on the right. As of July 23 2015 we have achieved 89.8% of our target which amounts to $484,638 of our target total of $540,000. Thank you to all who have donated your time or financial aid ... much appreciated! On the Donations page I updated the Small Business Donors section! We now acknowledge donations made In memory of. The committee is looking at some type of acknowledgement at the Gander Heritage Memorial Park. Both PayPal and the Town of Gander have no means of recording the donation made In memory of. If you want your name to appear as a donor In memory of on this website please email our Site Administrator Gerard at gerard.mccarthy.99@gmail.com or Committee Member Maxine at maxine@briggsaero.com and your donation will be recorded as such and will be shown as In memory of. You may purchase plaza stones by simply making your donation in the same manner as detailed on this website and then send a short email to Maxine maxine@briggsaero.com denoting that the donation is for the "purchase of paving stone(s)". Receipts for income tax purposes will be issued by the Town of Gander. will take place Thursday, July 23, 2015, beginning at 2:00 p.m. The Lieutenant Governor, the Town Mayor, Royal Canadian Legionnaires, representatives of the Provincial and Federal Governments, military personnel, clergy as well as other dignitaries will be participating in the ceremonies. We are expecting the attendance of two Prisoner of War veterans who survived the Japanese war camps and regard Sgt. Gander as one of their comrades. Mark your calendar for Thursday, July 23, 2015, 2 p.m. and why not join us. You can view this advertisement PDF in a new window by clicking on this pop-out icon or on the same icon in the upper right hand corner of the above preview. These photos are courtesy of the Park's committee member Carol Walsh. They were taken on July 11th at dusk and show the Park in all its splendor! These photos are courtesy of the Park's committee member Carol Walsh. They were taken on June 13th! These photos are courtesy of the Park's committee member Carol Walsh. They were taken on July 17th. How about this for a telephone utility box? Thanks to Bell Aliant, Designer Greg Seward and Maxine Smith for getting this done! What a splendid job by the Committee and all involved!